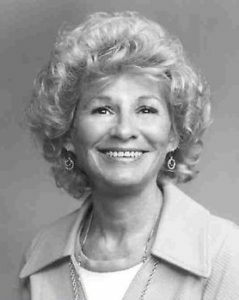 Eileen B. Brookman served her community as an assemblywoman, activist, and businesswoman. She was involved with the American Business Women’s Association, the National Association for the Advancement of Colored People (NAACP) and the Women’s Democratic Club, while working for issues such as the Equal Rights Amendment (ERA), Native American rights, and senior citizen rights. Eileen Milstein was born in Denver, Colorado, on October 25, 1921. She married George Brookman on July 11, 1941 and the couple moved to Las Vegas after having two children together. Brookman entered Nevada state politics in 1962 when Governor Grant Sawyer appointed her as the Indian Commissioner. She became a Nevada State Assemblywoman in 1965 and served until 1977. Due to her short stature (4’10”), Brookman wore orange everyday to make her visible in the legislature. This color became her signature, adorning campaign materials and became a recognizable color in District 9 even after she was no longer in office. She ended her voluntary retirement from the legislature by winning election to her seventh term in 1986 and was reelected in 1988. During her 16 years in the legislature, Brookman served on the Government Affairs Committee, Health and Welfare Committee, and Education Committee, and was the vice-chairman of the Legislative Functions Committee. She also served as vice-chairman of the Assembly Waysand Means Committee. Brookman was a consistent supporter of legislation to establish and improve senior citizen programs, handicap programs, and juvenile justice services. Brookman sponsored the Older Americans Act that brought necessary funding to Nevada for senior citizen benefits, including the creation of the State Division of Aging Services and the “Meals on Wheels” program. During the 1975 Legislative Session she introduced a bill to eliminate pay toilets, which then became a national issue. Women shouldered the majority of pay toilet fees as men used stalls much less frequently. Brookman was recognized for her dedication to individual rights and her commitment to her community. She was named Humanitarian Mother of the Year for Clark County in 1974, Woman of the Year by the City of Hope and was chairman of the Nevada delegation to the White House Conference on Aging in 1982. As a result of that position, Brookman was appointed to the Nevada Commission on Aging. She was awarded the Nevada Distinguished Citizen Award from the Board of Regents of the University of Nevada in 1982, and was appointed to the State Taxicab Authority the same year. Eileen Brookman papers. Nevada Women’s Archive. Special Collections, UNLV. Collection number: 95-014.